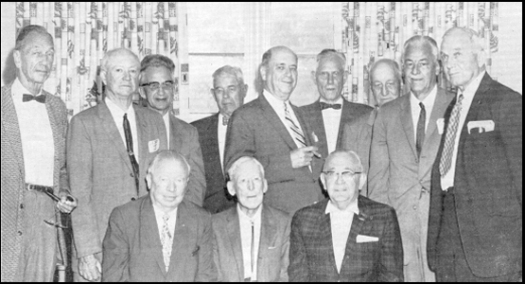 Standing --- (Left to right): Harry Copland, Jack Curry, Reinhardt Ausmus, Howard Wehrle, Alan Bonnalie, Leo Kimball, Ralph Royce, "Zip" Zistel, and Trubee Davison. Seated --- (Left to right): Three past presidents of the Early Birds - Russell Holderman, Frank Lahm and George H. Scragg. For the first time in 43 years, combat pilots of World War I gathered together for a reunion. This initial meeting was held at Wright Patterson Air Force Base in Dayton, Ohio, June 24-26, and the site was indeed a fitting one, being as it was the real birthplace of aviation. Henceforth the reunions may be annual affairs following this most successful initial venture. The reunion took place in conjunction with a great air show designed for pilots, old and new, with strong emphasis on the oldtime flyers of World War I who were the guests of honor. Nostalgic memories were brought back as the Spads, the Nieuports, the Standards, the Sopwith Camels,and the Jennies cavorted through the air in dramatic fashion, many of them firing blankss from machine guns in simulated aerial warfare as it occurred in the skies of France in 1917-18. And there was acrobatic pilot Bevo Howard with a demonstration of loops, rolls, and inverted flying in a red and white Buecker Jungmeister, a biplane built in Germany in 1936. To bring the oldtime flyers, and the crowd that came to witness, up-to-date on more modern aircraft, SAC sent out their giant B-52's and the companion KC135 jet tankers. Then came the sleek supersonic North American F100 Super Sabres, the Air Force Thunderbolts, with their great precision acrobatics and close formation flying. Some 350 World War I overseas flyers were present, and over 200,000 other observers to view one of the greatest pilot shows ever put on. Among the veteran pilots attending, 18 Early Birds were located, and we're pretty sure we covered all of those present. Most naturally, after a few had convened, it was decided that an EB meeting should be held, and this was arranged for the afternoon of Monday, June 26. In attendance at this affair were: Harry Copland, Florida; Reinhardt Ausmus, Ohio; George Scragg, Ohio; "Zip" Zistel, Ohio; Frank Lahm, Ohio; Jack Curry, Colorado; Trubee Davison, New York; Leo Kimball, Connecticut; Howard Wehrle, Ohio; Alan Bonnalie, Colorado; Russell Holderman, New York; and Ralph Royce, Florida. Others who were at the show but could not attend the EB meeting because of other activities or the fact that they had left town were Rob Lee, Texas; Luzerne Custer, Ohio; Arthur Christie, Washington, D.C.; Art Hartman, Iowa; Paul Garber, Washington, D.C.; and Tooey Spaatz, Washington, D.C.
We were glad to have Frank Lahm to head up our meeting as he has done so many times before. Although the gathering might be considered a sectional affair, it will be noted that a good cross country representation of members were present. The photo shows those in attendance with three past presidents seated in the center. The meeting was a most constructive one and should go far toward creating amiable relations throughout the organization. It was a pleasant affair indeed, and was thoroughly enjoyed by all present. Art Hartman's "Harmony" Jennie, which was flown by Frank Tallman, was in evidence with the listing of Early Birds on the side and wings. Another recognition of an EB, apart from the great ovation given to Frank Lahm for his contributions to combat flight, was the presentation of the EB 50-year plaque by the Chamber of Commerce to Luzerne Custer at one of the banquets. Throughout the show and the attendant dinners and meetings, the Early Birds held a prominent place. Those who had their fingers in the planning should be congratulated on one of the best organized events of its kind.